Touch technology has fundamentally (and quite literally) changed the way we interact with our devices. With the swipe of a finger we can now explore, discover, and learn in ways that were never previously possible. Here to talk about how Acer is doing it's part to develop touch technology is senior product marketing and brand manager Eric Ackerson. 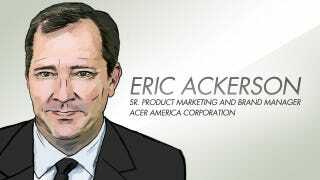 It's Eric's job to help the company realize strategic opportunities and to develop and deliver successful products like Acer's Windows 8 lineup. So head below to ask Eric everything and anything about Acer's influence on touch tech, their entire line of products, and what the company has planned for the future — and then head here to explore all of Acer's latest touch offerings.